E*Kits I.V. Start Kits: Medline sterile E*Kits were designed to allow clinicians to provide excellent patient care with quality products, while streamlining components, reducing waste, and offering cost-effective supply solutions. Instead of creating storage space for numerous items which are pulled again and again for similar procedures, a convenient sterile E*Kit from Medline is a single item pulled from a single location. Components are packaged in sequence of use, allowing the clinician to progress efficiently through procedures. Sterile E*Kits can be a valuable tool in standardizing protocols for quality patient care; when the items necessary for a procedure are supplied in a single tray, facility protocols and continuum of care are easier to be established and maintained. Cost-Effective. Since all components necessary to perform the procedure are prepared in a single sterile disposable tray, less time needs to be spent ordering supplies and preparing for the procedure, saving your facility both time and money. Sterile E*Kits from Medline include standard components. You can also design your own custom sterile E*Kit to meet the specific needs of your facility. Medline?s I.V. Start Kits streamline your procedures. Components are conveniently assembled, sterilized and packaged to save valuable nursing time. Available with or without gloves. The components are conveniently assembled, sterilized and packaged to save valuable nursing time. With fewer packages to open, the risk of contamination is greatly reduced. Available with povidone-iodine or Chloraprep antiseptic for site preparation. 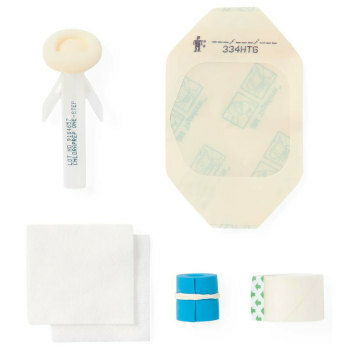 Note on Transparent Dressing: (S) = Suresite, (T) = Tegaderm, (B) = Bioclusive Contains: ChloraPrep Sepp 0.67mL Applicator, 2 Gauze Sponges (2" x 2"), Framed Transparent Dressing, Tape, Dressing Change Label, Tourniquet.